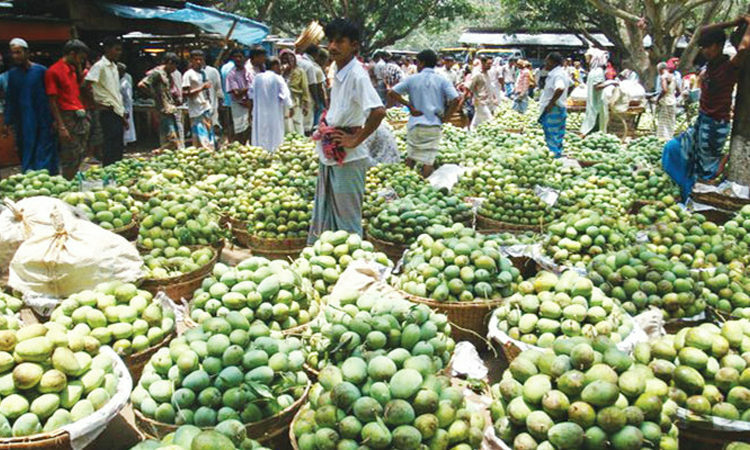 Mango trading has started gaining momentum in different markets of Rajshahi and Chapainawabgonj districts with appearing varieties of the seasonal fruit along with rushing buyers from across the country. The markets famous for mango business including Baneswar, Shaheb Bazar, Haragram, Upashahar, Shalbagan, Rajabari, Godagari, Kansat and Rohanpur have got an eye-catching look amidst bumper production. Many of the small-businessmen are seen selling mango on roadsides or vending at localities on rickshaw-vans. Montu Sarker, lease-holder of Baneswar Bazar, said farmers and traders have started harvesting mango after getting instruction from the district administration this year. That’s why mangoes are appearing in the big market for the last 10 to 12 days as Gopalbhog and some other indigenous varieties have become ripen naturally. He said at least ten trucks mangoes are being transported to various markets across the country including the capital city Dhaka from here. Like the previous years, people from across the country are coming to Rajshahi and its outskirts especially Baneshawar Bazar to buy quality juicy mangoes. Forman Ali, a wholesale trader, said Gopalbhog mango is being sold at Taka 1,000 to 1,700 per mound according to quality while the native varieties at Taka 600 to 1,200. He also said around 2,500 mound mango is arriving here every day. Mango business will become peak after next seven to eight days when all the improved varieties will be harvested. Besides the market, hat and other growth centre ones, the mango-based trade and business has changed the rural economic scenario of the region as a whole. “We are selling 30 mounds of mangoes at Taka 2,000 per mound every day,” said Emdadul Haque, a mango trader of Shaheb Bazar. The daily selling rate will hit to 80 to 90 mounds when all the major varieties will come, he added. Centering the marketing of mango, also an important cash crop in the region, a large number of people are involved in various types of works. SM Mustafizur Rahman, Additional Director of Department of Agriculture Extension, said mango was cultivated on 26,150 hectares of land with a production target of 2.44 lakh metric tons in Chapainawabgonj, 12,671 hectares with production target of 1.62 lakh metric tons in Naogaon, 56,021 metric tons production target from 4,823 hectares in Natore district. Apart from, there were 16,961 hectares of mango orchards in Rajshahi district last year. This year the figure rose to 17,463 hectares with around 24.27 lakh trees. If there were no major natural calamity mango production is expected to 2.18 lakh metric tons in the district this year, Agriculturist Rahman added. Dr Alim Uddin, Principal Scientific Officer of Fruit Research Station, said mango farming is increasing every year and the gardeners are earning huge profits by cultivating high yielding and hybrid varieties like Amropali side by side with the traditional and popular indigenous varieties.